Kong Automatic UI Hider can fade out pieces of the user interface (Minimap, PlayerFrame, Recount, etc.) and then automatically show them again when moused-over, entering combat, or any of several other user-specified conditions are met. All conditions can be negated by preceding them with "no" (e.g. [nogroup:raid] will show a UI element when you are not in a raid). More information on macro syntax can be found here. 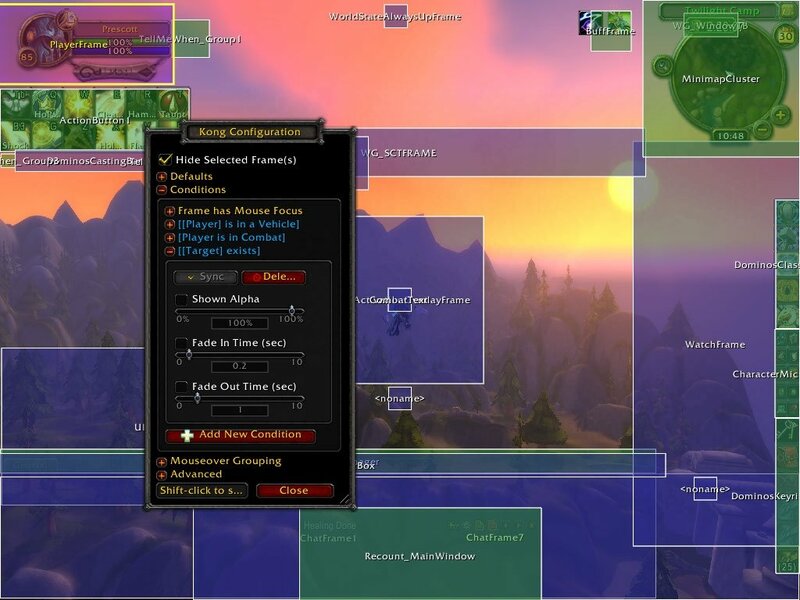 Hold shift while clicking in the config GUI to select and configure multiple frames simultaneously. Use the mouse wheel to uncover overlapped windows in the config GUI. Setting the Hidden Alpha of the Minimap to 1% will allow quest and other tracking icons to remain visible while the Minimap is faded out. Kong supports multiple profiles via the command line. Type /Kong profile in-game for more info. 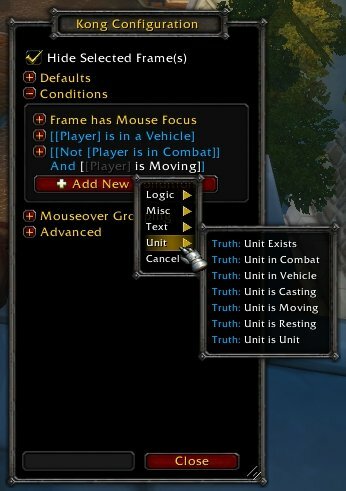 Binding a key to the "Toggle UI Fading On/Off" entry under Kong Automatic UI Hider in the Blizzard Key Bindings menu will allow you to quickly display all hidden frames when needed. - Fixed an error that would occur when hiding frames in combat or in a vehicle. - Child frames (e.g. individual action buttons, raid member frames, etc.) can now be faded by right clicking the parent frame in the config screen and selecting 'Configure Children'. - Added events Quest Acceptance and Quest Update to condition menu. - Added new conditions Unit in Range of Spell and Event Occurred Recently. - Added convenience conditions Unit Health is Low, Unit Power is Low, and Unit in Instance as alternatives to setting up more complicated comparison conditions. - Added a keybinding to open the config GUI. - Fixed a error that would occur when attempting to apply a user-entered value to multiple frames at once. - Fixed a bug where the Unit is Resting condition would not update properly when entering or leaving an instance. - Fixed incompatibilities with TukUI. - Fixed a bug that prevented the Target of Unit condition from working correctly. - Fixed a bug that prevented Unit Power conditions from working correctly. - The input field of the user-entered value popup will now default to the previous user-entered value, if any. - Fixed an error that could occur when the conditions of a recently unregistered frame were met (I mean it this time). - Fixed an error that could occur when the conditions of a recently unregistered frame were met. - Fixed an error that could occur when closing the config GUI. - Fixed a bug that caused the minimap to remain hidden when Kong was disabled. - Reverted back to the old fading method to avoid graphical issues caused by the Blizzard animation API (e.g. Grid background). - Invalid conditions (e.g macro conditions missing square brackets  and comparisons of different data types) will now appear in red. - Added descriptions that summarize each condition. - Added a Unit is Mounted condition. - Various GUI tweaks to improve clarity. - Fixed a bug that could erase all settings when the Config GUI was loaded using an addon like ACP but never actually displayed. - Fixed a bug that caused the sync button to create copies of conditions with user-entered values cleared. 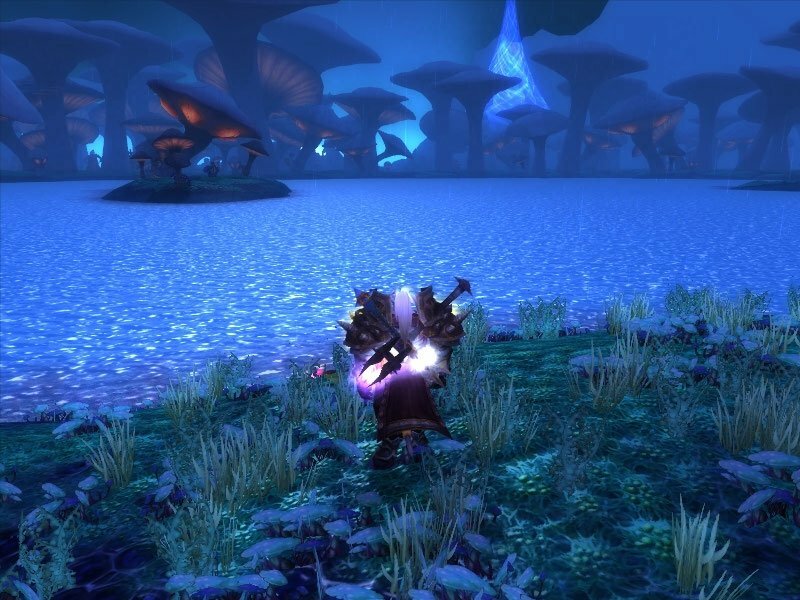 - Kong now uses the Blizzard animation API to perform fading for increased efficiency. - Completely overhauled the way conditions are specified to provide more power and flexibility in determining when frames are shown. - Several new conditions are available including Power Level (Mana, Energy, Rage, etc. 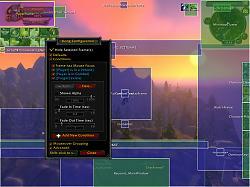 ), Instance Type (Dungeon, Arena, etc), Resting State, Unit Motion, and others. - Each section of the config GUI is now collapsible. Sections will be automatically collapsed when they aren't in use. - Fixed a Lua error that could occur after loading an area with the config GUI open. - Fixed a bug that prevented Kong from finding the names of frames that had numeric or boolean values in them (e.g. ElkBuffBars). - Fixed a bug that could cause frames to become unregistered if they changed parents between sessions or if profiles were shared between characters. - Various other config GUI tweaks. - Fixed a bug that was preventing frames with non-alphanumeric characters in their names from saving between sessions (e.g. "DominosActionButton-11"). - Added support for showing frames based on health. - Added an Override Alpha option in the Advanced section for use with frames that set their own alphas. This replaces the default functionality from version 1.0 that was causing tainting issues. - Added a Don't Draw when Hidden option in the Advanced section for frames that don't fade out properly. - Fixed a bug in Blizzard's code that causes 3D models to appear regardless of their alpha. - Fixed a error that could occur when loading frames. - Full support for frames that are loaded anytime after login. Kong will no longer unregister frames that it can't find initially. - Improved support for saving unnamed frames between game sessions. See the 'Advanced' section in the GUI for frames that could not be saved previously. - Added a "/kong reset" command that can be used to clear all settings from the current profile. - Fixed a bug that would prevent frames from appearing on mouseover the first time Kong was loaded. - Added the word "Automatic" to the addon name in an attempt to better describe the addon's functionality and prevent confusion among those who might think "Kong UI" is a UI compilation. - Fixed a bug that was preventing users on from being able to manipulate the default profiles for characters on realms with spaces in their names. - Fixed an error that would occur when using /kong show on a frame that was part of a mouseover group. - Fixed an error that would occur when the in and out alpha of a frame or trigger were set to the same value. - Fixed an error that would occur if a user omitted the word "in" or "out" when setting fade speed. - Fixed an error that could occur when Kong attempted to fade a frame that was already being faded using the UIFrameFadeIn/Out methods. - Kong will now be able to find some additional late-loading frames. - Fixed a bug that would cause frames to remain on screen after a member of a mouseover group was unregistered with /kong show. - Fixed a bug introduced in version 0.9 that could prevent a frame's configuration from being saved between game sessions. - Added "/kong profile" for managing Kong configurations and sharing them between characters. - Added "/kong casting" to configure frames to appear while casting. - Fixed a bug that could cause frames to disappear when faded in and out at the same time. - Minimap icons will now be hidden along with the minimap itself. - Minimap terrain should now always be visible when the minimap is at least 88% alpha. 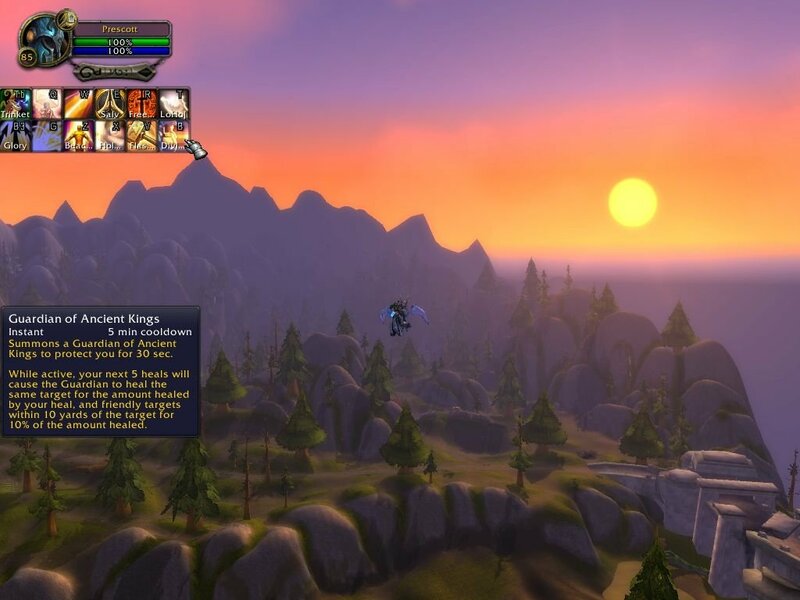 This is a workaround for a Blizzard minimap bug that causes the minimap contents to disappear when it is faded out in certain areas of the world. -Fixed a bug that could cause frames to remain either hidden or shown after entering certain vehicles or being picked up in a boss fight (Chopper sidecar, Archavon, Kologarn, Lord Jaraxxus, etc.). -Fixed a bug could cause frames to remain hidden after zoning in or out of an instance. - Added "/kong group" to configure frame grouping. This allows multiple frames to appear when a single frame is moused-over. - Fixed a bug that was preventing "/kong nocombat" from working correctly. - Added "/kong macro" to configure frames to appear when a given macro condition is met. - Added alpha commands for individual triggers (ie. "/kong combat alpha") to allow for different frame alphas under different conditions. Default frame alpha can still be set using "/kong alpha". - Added speed commands for both frame defaults ("/kong speed") and individual triggers (ie. "/kong combat speed") to control the rate at which frames fade in or out. - Added "/kong mouseover" to support customizations to the fade speed and alpha of frames when the mouse is moved over them. - Added "/kong enable" and "/kong disable" commands and entries for these commands in the Key Bindings screen. - Due to significant code structure changes, user settings from previous versions will be lost. - Update for patch 3.1 compatibility. - Added an entry in the Key Bindings screen to allow quick toggling of UI fading on/off. - Fixed a bug that would cause Kong to fade frames after reloading the UI even if Kong was disabled. - Added "/kong nocombat" to configue frames to appear when out of combat. - Added "/kong vehicle" to configure frames to appear when in a vehicle. - Fixed a bug that could cause a frame to fade out when it shouldn't. - Fixed a bug that prevented "/kong combat" from working when not in combat. - Fixed a bug that would cause frames to be hidden at login when Kong was disabled. - Fixed a bug that would cause frames to reappear after they had been removed from the screen (party frames out of party, etc). - Fixed an "Interface action failed because of an AddOn" bug. - Fixed a bug that caused registered frames to be permanently shown on screen when /kong combat was used in combat. - Renamed to Kong UI Hider to (hopefully) make the addon more visible to those searching for its functionality. - Added the ability to control faded and shown alpha. - Added the ability to toggle Kong on or off. - Fixed a few nil index errors related to saving data between sessions, and added warnings to the default chat log when these issues occur. - Added the ability to configure frames to either appear in combat or stay hidden until mouseover. You should be able to do this with the latest version by right clicking on the main actionbar in the Kong Config screen and selecting "Configure Children". Is there a way to show a frame when you accept a quest? I don't need it to stay shown just make it visible. There are now Quest Acceptance and Quest Update events in version 1.6. Use these in Event Occurred Recently conditions to show a frame for a few seconds. Last edited by xentaros : 10-29-12 at 04:49 AM. I'm running into a problem where my changes in Kong do not save upon logout. Tried deleting my cache folder, deleting saved variables for Kong and also reinstalling the addon but nothing works. 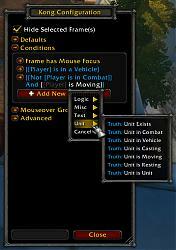 Everything in the addon works fine before I logout except for the mouse over to show function. It sounds like your settings have somehow become corrupt. The first thing I would suggest is using /kong profile reset followed by a /reload. However, if you have already tried deleting the kong WTF files (both .lua and .bak files) then this may not help. In that case I would need more information. Have you renamed any frames under the advanced section of the Config GUI? And can you send me your World of Warcraft\WTF\Account\<acctname>\SavedVariables\Kong.lua file via PM? I managed to fix it by doing a windows search for any kong files in my WoW folder, deleting them all and doing a reinstall of the addon. I guess I missed some .lua and .bak files the first time around. Is there a way to show a frame when you accept a quest? Not currently but I think I can include it in the next version. Is it possible to keybind the minimap so i can toggle it on or off ? You don't really need Kong to do that. You can use a simple macro like /run Minimap:SetShown(not Minimap:IsShown()) to toggle minimap visibility. Kong is designed to this for you automatically using conditions such as [[Player] is Moving]]. However, if you still want to use Kong you can use the "Toggle UI Fading On/Off" action in the Key Bindings menu to simulate this. Does Kong support hiding UI elements while in pet battle state? Yes, use [Macro Condition [[nopetbattle]]] (don't forget the [square brackets] around the macro text). This will show things when NOT in a pet battle and hide them otherwise.